Throughout the past several thousand years, Israel has often been the center of international controversy. It seems as if spiritual battles over that land are still triggering events in world politics today. With this in mind, it is good to be reminded that God tells us to “pray for the peace of Jerusalem” in Psalm 122:6, above. 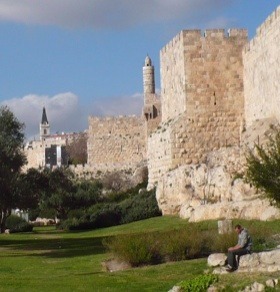 Shalu shalom Yerushalaim, yishla’u ohavaikh. You can hear the alliteration, as the soft sound of the “sh” is used in the words shalu (ask, pray), shalom (peace), Yerushalaim (Jerusalem), and yishla’u (security, tranquility). You can also sense the closeness of the parallel ideas of shalom (peace, well-being) and shalvah (tranquility, security, ease). The message of the verse is that those who care about God’s children in that troubled land will find tranquility themselves. Why? God has chosen Israel for a purpose that is will not be fulfilled until the end of the age. The people there experience the ongoing struggle within all of humanity, spiritually. They are no better and no worse there than the rest of the world, and when we pray for God’s shalom to be established there, we are praying for ourselves as well. It is all about Loving God with all you heart, with all your mind, and with all your soul,isn’t it? and the outpouring of the Love of God in Jesus when we believe gives us the ability of loving our neighbour as ourself , isn’t it. Just FYI your Bible verse on this is wrong. It is Psalm 122:6-7 not 112:6-7. Psalm 112:6-7(KJV) is the following verse “6 Surely he shall not be moved for ever: the righteous shall be in everlasting remembrance. 7 He shall not be afraid of evil tidings: his heart is fixed, trusting in the Lord.” I thought you might just want to know that. Thanks for pointing this out – I fixed it.